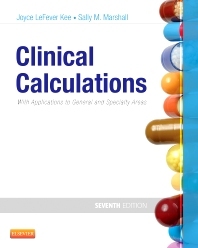 Coverage of all 4 major drug calculation methods — ratio & proportion, formula, fractional equation, and dimensional analysis — allows you to apply the method that works best for you. A section on specialty areas and lifespan prepares you for the wide range of clinical calculations needed to practice in pediatric, critical care, labor & delivery, and community settings. A comprehensive post-test enables you to test your understanding of key concepts from the text. Current drug information ensures you are familiar with the most commonly used drugs in clinical practice. Up-to-date content on the latest drug administration techniques and devices helps you master the various forms of drug administration, including oral, intravenous, intra-muscular, subcutaneous, and other routes. Remember boxes identify pertinent concepts you should commit to memory. Note boxes emphasize important points related to concepts presented in each chapter.